Ever since we went to Elfin Lakes for a day hike back in 2013. we knew we will return and stay longer. 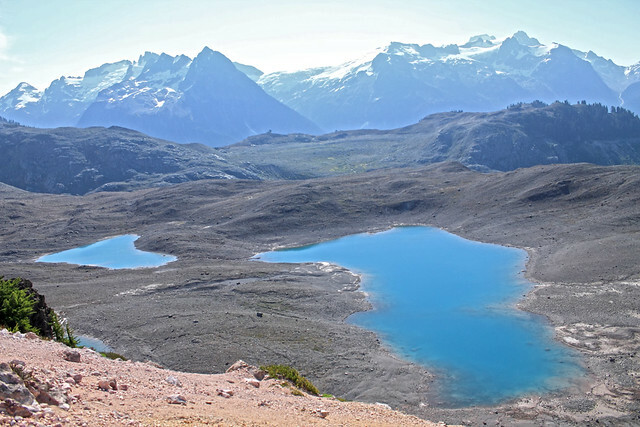 The plan was to hike more in the area; south part of Garibaldi National Park offers several interesting places to visit. But to get to lakes and camp site you need to hike 11km from a parking lot, gain almost 500m of elevation (lakes are on about 1460m above the sea level) and you need to carry everything: tent, sleeping bags, food, water for at least a day and all other small or big things you might need. Water could be obtained from one of the lakes restricted only for that purpose: no swimming or washing in it, but it is smart to treat that water anyway before drinking. I don’t have to say that scenery is amazing. This is probably the closest to what you might see outside of Canadian Rockies that has the same impact on mountain hiker and nature lover. When we came to the point where I took that photo, I forgot pain in tired legs, high temperature and heavy load on my back. We stopped there for a short break and to enjoy the scenery. Just couldn’t wait for the next day and our hike further in the park. So we hurried toward the lakes and camp site to set the tent, have a dinner and spend our first night there. At first, the plan was to go to 11km distant Mamquam lake, but I’ve found that part of the trail is washed away and still not repaired. That was enough for us to change the plan and go to shorter but maybe even more rewarding place. Opal Cone. Opal Cone is 1736m high remnant of a volcano that had its last eruption about 9,300 years ago. 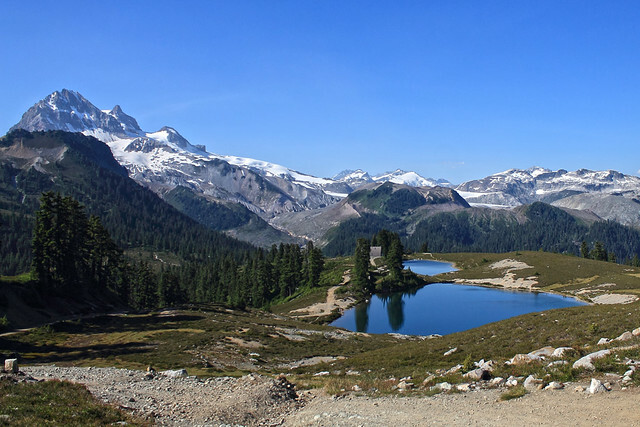 It is about 7km away from a Elfin Lakes camp site. We had an early morning breakfast and got ready for hike even before 7 a.m. Trail leads downhill for first 2-3km, toward Ring Creek some 300 meters lower. But universal rule of the mountain hiking says that as much as you go down you will have to climb that back 😛 Crossing the creek was kind of easy – more for San than for me – there is a narrow bridge where you need to balance while crossing and that was a part I didn’t like. Silty water is rushing just a couple of meters below distracting me enough to slow my crossing. I admit I have a bit of a height phobia, unlike San who crossed it in no time 😀 After that a trail is going mostly upwards all the way to the top of Opal Cone. In the morning that side of trail is in the shade of the nearby ridge and we appreciated that, even more when we were on a way back. Scorching hot day and no tree to hide. Anyway. There is only one section of a trail that is tricky to hike, very steep with volcanic rock that doesn’t provide solid footing. But what awaited us on top was worth it. Amazing breathtaking views! 😎 From someone that’s been stuck at work for months, these images made my day! Ha, now you understand why we were so anxious to go to that hike 😀 I am glad you like them. When we finally came to the top of Opal Cone, I didn’t know what to start photographing first, it was so breath taking. As for wild fires, we are having more than 190 of them in British Columbia only. Plus the ones in Alberta and Saskatchewan. They lifted air quality advisory for Vancouver yesterday but we are still hoping for some rain this weekend. I remember last summer when we had some smoke from a huge wildfire in Siberia. I couldn’t believe how far it may travel…..
Great adventure, really I enjoy reading this post. Wow! This is quite an accomplishment. I know what it’s like to be thirsty, so I can only imagine the prompt this gives for next time regarding water. Glad you didn’t have trouble with the smoke and breathing as you were so close- we had haze and even a couple of us had irritated eyes from the Canadian fires way down here. Gorgeous scenery! What a treat. That wind storm and the fact that we were above 1400m (4,500 ft) guaranteed that we won’t have trouble with breathing. But when we returned home everything smelt to smoke and sky was literally yellow for almost a week. But you are right about scenery. It was fantastic!